The Commission on Accreditation for Law Enforcement Agencies (CALEA) is a Virginia based agency which grants accredited status to law enforcement agencies throughout the world who meet strict criteria established by the Commission. CALEA was formed in 1979 for establishing a body of standards designed to (1) increase law enforcement agency capabilities to prevent and control crime, (2) increase agency effectiveness and efficiency in the delivery of law enforcement services, (3) increase cooperation and coordination with other law enforcement agencies and with other agencies of the criminal justice system, and (4) increase citizen and employee confidence in the goals, objectives, policies and practices of the agency. In addition, the commission was formed to develop an accreditation process that provides law enforcement agencies an opportunity to demonstrate voluntarily that they meet an established set of professional standards. These four major law enforcement executive membership associations - International Association of Chiefs of Police, National Organization of Black Law Enforcement Executives, National Sheriff's Association, and Police Executive Research Forum - joined forces to create the Commission and to appoint its members. The Commission is composed of 21 members: at least 11 law enforcement professionals, and the balance from governmental areas and from the private sector. The Commission reflects the broad representation from state and local levels as well as from many regions of the United States and Canada. Following its first organizational meeting in 1979, the Commission turned its attention to the consideration of standards drafted by the four associations. The final chapters of the draft standards were approved on May 1, 1982. During this 28-month time frame, there were organizational changes. The four associations incorporated the Commission as an independent, non-profit corporation on October 1980. In March 1981, an Executive Director was employed to begin work on program implementation. Since then other staff have been employed. After approval of the draft standards, the four associations and the Commission's staff initiated a field review of the standards developed and developed the accreditation process, including all relevant policies, procedures, manuals and forms. Most of 1982 and 1983 were spent with field testing the standards and the accreditation process. The standards and process received final approval from the Commission in September 1983. Since initial approval, the standards have undergone many interpretations, adjustments, and amendments. These changes were reported in eight major change notices issued between September 1983 and November 1992. In May 1987, the Commission reprinted the second edition of the Standards Manual (Standards for Law Enforcement Agencies) in loose-leaf form and initiated an update service. In March 1993, the Commission ordered a top-to-bottom review of the standards and accreditation process after nearly ten years of operation. A Review Task Force, representing a wide cross-section of the Commission's user community, undertook an extensive, year-long review of the standards. Following several drafts and a field review, the task force made final recommendation the Commission and the third edition of the Standards Manual was approved in March 1994. The Fourth Edition of the Standards Manual was issued in January 1999 and the number of standards was increased from 436 to 446. The Fifth Edition was issued in July of 2006 and contained 484 law enforcement standards organized into 39 chapters, or topic areas. The Sixth Edition was issued in April 2017 and contains 460 law enforcement standards organized into 37 chapters, or topic areas. This followed a significant reassessment of standards and chapter organization. In the Commission's view, the standards reflect the best professional requirements and practices for a law enforcement agency. Initially the Charleston Police Department successfully completed this process in May of 1991. The Charleston Police Department was the first municipal law enforcement agency in the State of South Carolina to successfully complete this process. The Department was re-accredited in 1996, 1999, 2002, 2005, 2008, 2011, 2014 and 2017. 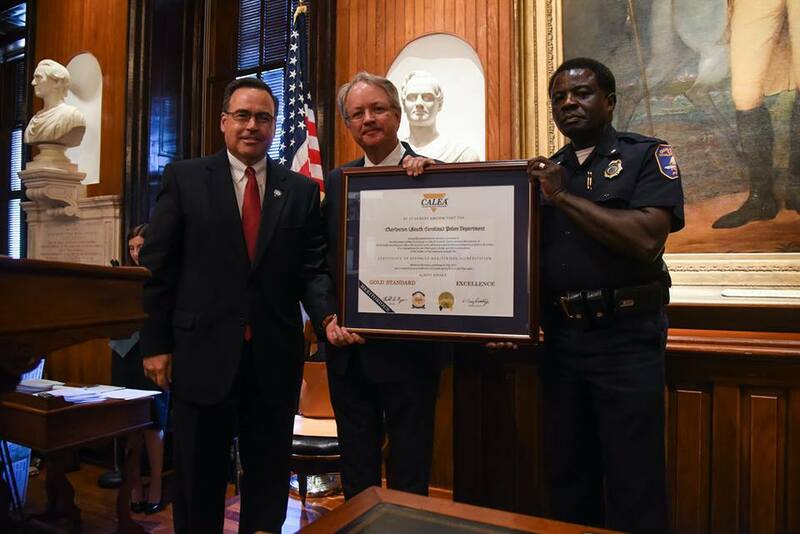 The Charleston Police Department was awarded “Accreditation with Excellence” three cycles in a row following the 2011, 2014 and 2017 on-sites. CALEA established this award with the intent to provide agencies an opportunity to be further recognized for the effective use of accreditation as a model for enhanced public safety service delivery. The Charleston Police Department is also a leading member of the South Carolina Police Accreditation Coalition (SCPAC). SCPAC is modeled after CALEA. A police department does not have to be accredited by CALEA to become accredited by SCPAC. The Accreditation Manager for the Charleston Police Department is Sergeant Craig DuBose.